My cousin's family spotted this animal while driving in the country. Thanks for the picture, Paulina. 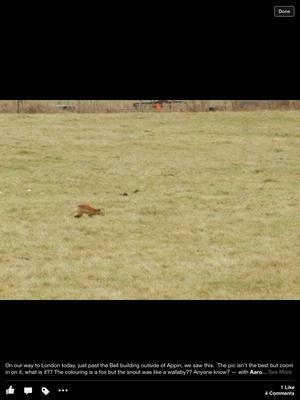 I'm not sure, because the animal is so far away, but if I had to take a guess, I'd say it was a Red Fox. It looks like the animal is facing to the right and has a black tip on it's tail. I'm not sure though ..... readers, what do you think? Please comment to let us know your thoughts. Comments for Can anyone identify this? Groundhog or Beavers or maybe Capybara. It looks like a Red Fox. Yes, I agree that it looks like a Red Fox.